The aim of this study is to study the prevalence of mental distress at the end of pregnancy and after birth and the impact of selected socio-demographic and obstetric factors. This is a cross-sectional study. The sample is consisted of 351 puerperal women at the age of 18 and over. Sociodemographic, obstetric variables were collected to detect significant psychological distress; the instrument used was General Health Questionnaire (GHQ-28). Logistic multivariable regressions were used to investigate associations. The prevalence of significant mental distress amounted to 81.2%, mostly related to social relationship and anxiety. 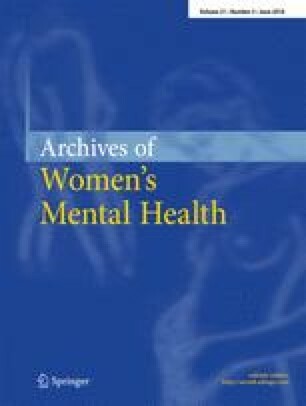 The women who affirmed having more stress during pregnancy had too significantly increased emotional distress before the birth as well as during early puerperium, increasing somatic symptoms (p < 0.001; OR 2.685; CI 95% 1.583–4.553), anxiety (p < 0.001; OR 4.676; CI 95% 2.846–7.684), and depressive symptoms (p < 0.01). Somatic symptoms (p < 0.05; OR 2.466; CI 95% 1.100–5.528) and social dysfunction (p < 0.001; OR 1.672; CI 95% 0.711–3.932) occur most frequently in women who already had children. Regarding socio-demographic data, being an immigrant is the only protective factor reducing the social dysfunction in the last weeks of pregnancy (p < 0.01; OR 0.478; CI 95% 0.274–0.832). Psychological distress at the end of a full-term pregnancy and in the postpartum period occurs frequently and was associated mainly with stress experienced during pregnancy and parity. It is advisable to perform proper assessment of stress and significant psychological distress at the early stage of pregnancy and repeatedly later on until delivery. Information and support from professionals can help to decrease and prevent their negative impact on maternal and fetal health, as observed in the current evidence.